Sony has laid out an ambitious three-year plan that's designed to see the company become "the top brand in the overall camera market" by 2021. The plan, which was picked up by SonyRumors from the company's mid-term strategy paper, is certainly a bold and bullish statement. It's not quite clear though what Sony means by 'top', which could be interpreted in a couple of ways. It could refer to out-and-out camera sales (volume or value), or perhaps how the Alpha brand is perceived – but either way Sony has Canon and Nikon squarely in its sights. With impressive launches like the Alpha A9, A7R III and A7 III in the last 12 months, Sony's already turning up the heat on its rivals. Sony has recognized that competing brands are becoming more aggressive in the market (with Sony’s Senior General Manager of its Digital Imaging Business, Kenji Tanaka predicting we'll see mirrorless launches from Canon and Nikon soon), and intends to strengthen its products further, particularly its mirrorless range of cameras. 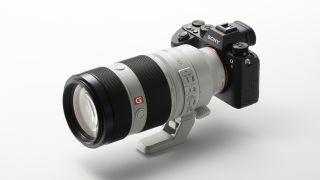 Another key initiative from Sony is expanding its lens range over the next three years. While Sony has done well to grow its range from the ground up there are still a few gaps, and this is certainly an area where Canon and Nikon have an advantage over Sony, with both brands offering a expansive range of lenses. Another key area that Sony is looking to develop is its professional market, by focusing on expanding its pro support services worldwide. This is another area where Canon and Nikon are well established, offering on-site support at sporting and other major events for photographers wanting kit serviced or loaned to them. All this can only be good news for photographers, as it promises to promote healthy competition between these huge brands, and hopefully it will lead to some really exciting new products in the near future.